Benjamin Franklin famously said, “Failing to plan is planning to fail.” And it wouldn’t surprise us if he were talking about money and how to budget. There seems to be common feeling that if I make a lot of money, I’ll be set. But that’s just not the case. Making money is only half the battle. The other half is making sure you spend wisely, and having a monthly budget is the secret sauce. How To Budget – Step 1: Figure out where and when your money is being spent. 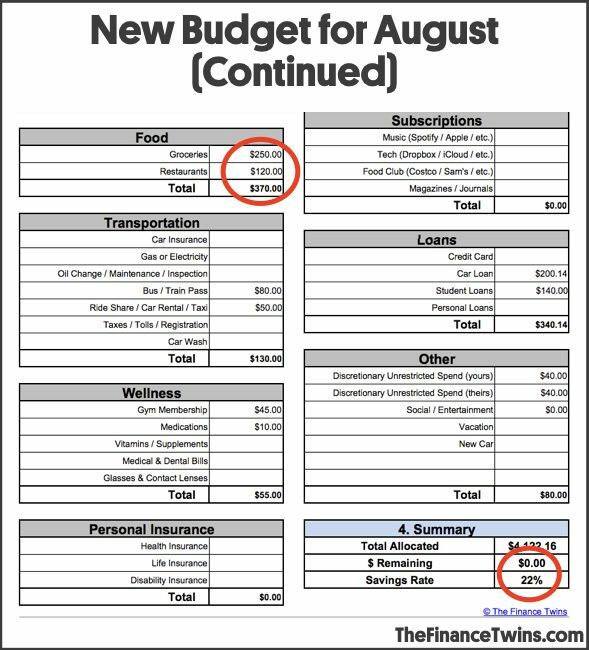 How To Budget – Step 3: Begin to input numbers into a new budget. What Else Should I Know About Budgeting? Remember, knowing where every single cent you earn is spent is the first step in taking control of your finances! Confident that you know how to budget? Comment below! It doesn’t matter if your paycheck has 2 digits or 5 digits, you need to know how to budget! Really, even if I am broke and barely make money I need a budget? 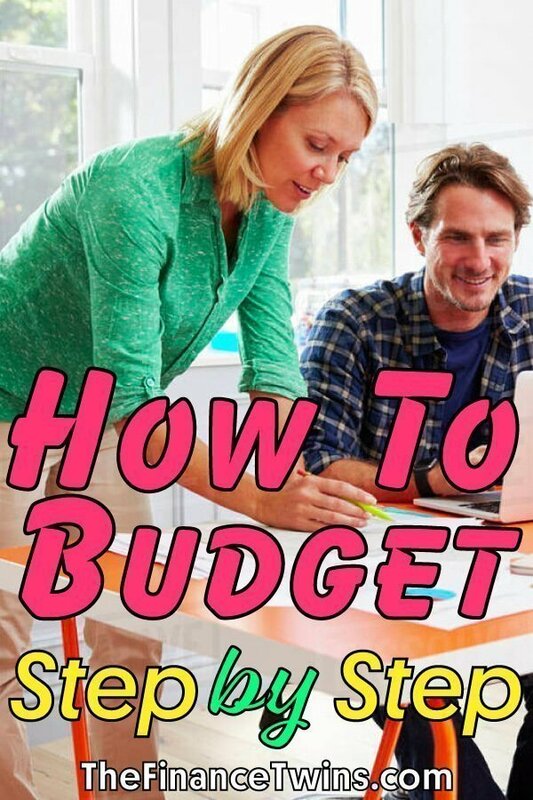 Yes, you still need to know how to budget! What if I’m rich and make more than I spend? We don’t care — you still need to know how to budget! Whether you are a student making $8 an hour or a high-flying lawyer making $300K a year, you need to create, follow, and stick to a monthly budget. Budgeting gives you power over your money. You control where it goes and how it’s spent. Whether you are paying debt or saving for the trip of a lifetime, you must be intentional with your money. This post will cover how to make a budget! 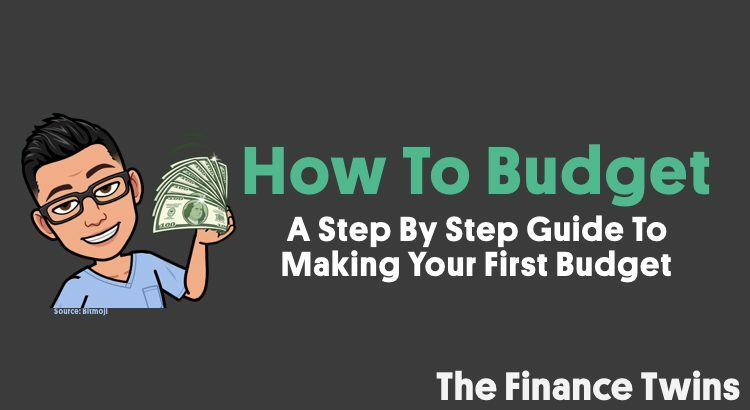 We are going to walk you step-by-step on how we helped one of our readers make their 1st monthly budget. Reminder: a budget is simply an accountability document, process, or system to manage your family’s monthly income and expenses. You need to control your money, not let your money control you. 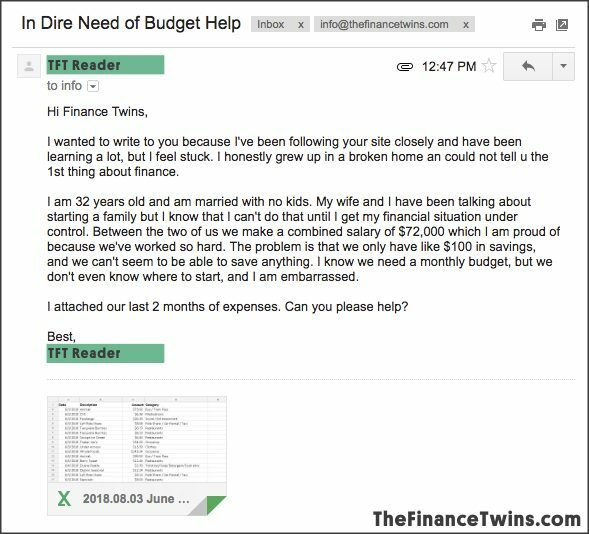 This past week we received an email from a reader who was asking for help creating a budget. They had a healthy household income, but were still living paycheck to paycheck and felt stuck. Their motivator for wanting to get their financial life in order was to be in a healthy position to start a family. They live in a high cost of living urban area and rent an apartment. The first thing that jumped out at us was that even though the reader and his wife have a decent salary, they didn’t let their pride get in the way of getting help with learning how to budget. Kudos to them. Secondly, only having $100 in savings at 34 years old is definitely not ideal, but they still have a lot of working years in which they can dig out of the hole and find stable financial footing. Thankfully, they’ve now learned how to budget! Before you create your first budget, there’s a few things you should do to make sure you don’t miss anything. In order to make sure you don’t miss any expenses or accounts you’ll want to review your credit report. This will list any loans, credit cards, or other debts you might have. You can check your credit report for free at www.annualcreditreport.com. If you’ve checked your report recently, or use an app like Credit Karma, then you’re all set and can move on. It’s a great habit to check your report every few months to make sure there isn’t anything you don’t recognize. You’ll also want to review and access all of your billing, paycheck, bank and credit accounts to get an updated view of everything. This will help make sure you don’t miss any automatic charges that might be going to an account you normally don’t check. You’ll need a holistic view of your finances if you want to create an accurate, actionable budget. Lastly, you want to get everyone who spends your / your spouse’s money involved. If you create a budget and don’t get your husband or wife involved, it will not work. Financial budgeting is a team activity, and everyone needs to be on the same page. Everyone has to buy in to the monthly spend numbers so that they can be held accountable. The first step in creating a budget is to understand where your money is going. The two key components are your income and your expenses. 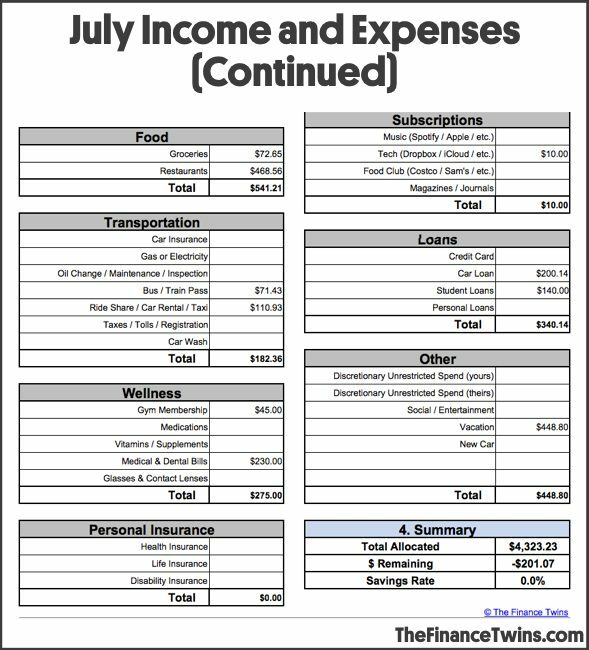 Our reader sent over their expenses from June and July in their email to us. We always recommend creating budgets on a monthly basis, so this was great, because we got 2 months of historical data to analyze. In their case, they said they have their accounts synced with Mint so they just exported the details and sent them over in Excel. Even if you don’t have Mint, you can export bank statements and credit card statements to get the same information. If you get paperless statements you can always copy and paste the pdfs into a spreadsheet, but it’s easiest to export them as a file, and not deal with copying and pasting from a pdf file. …so the first thing we did was categorize the expenses into categories so that we knew where their money was going. It doesn’t matter if they eat at Wendy’s or Chipotle (they went to both), what we wanted to know is how much they spent on restaurants in total (over $430 per month!). To categorize the expenses, we opened up a copy of our Budget Template and assigned their transactions to the different categories. This took us about an hour of work. But just remember that the first time is always the most difficult and time consuming. We did this in Excel, but you can also use Google Sheets or simply pen and paper. If you prefer to do it with the paper, you’d just want to print off the transaction data and then manually write the category next to the line item. We like using Excel because it makes it a breeze to add the categories up. Once we had added up the transactions by category, we input them into the Finance Twins Budget Template. This makes it a breeze to spot patterns and see where your money is actually being spent! 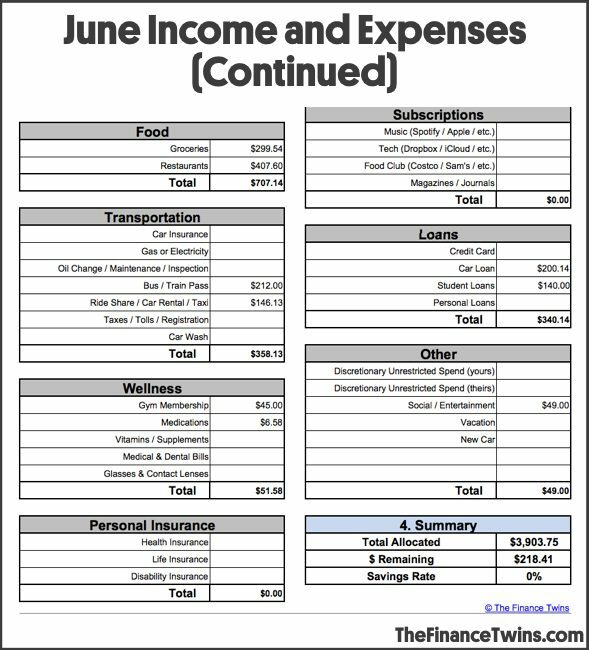 Right away, we noticed that their June take-home pay was $4,122.16 and they spent $707.14 on food. That’s 17% of their income! Their rent also accounted for 44% of their income which, is much higher than the recommended 30%! No wonder they find it so hard to save money. This is why it’s important to know how to budget. They also didn’t have any savings goals or targets they were working towards. Like most people without a budget, they were just hoping to spend less than they made, without fully understanding what was happening. Here’s their June data by spend category / bucket! Looking at July we see a similar spending pattern with a couple of notable highlights. In particular we notice that they spent $201.07 more than they made during the month! Clearly there’s too much spending happening. As we mentioned earlier, the big spending accounts are food and housing, so we will have to tackle those in August. If you take both June and July together, they actually had saved $17.34 from the $8,200 they made. Technically speaking, they spent less than they made, but unless they make BIG changes, they’ll have no retirement savings. This perfectly highlights why learning how to budget is so important. At this point we’ve completed the bulk of the heavy lifting when it comes to making a budget. 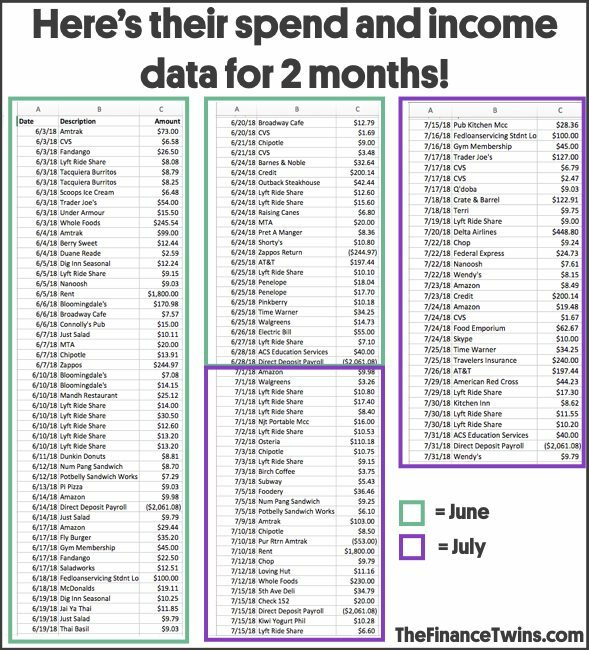 Now that we know exactly where and when their money is being spent, let’s focus on budgeting for the next month (in this case August). In order to know what to budget for the next month we need to look at what we’ve previously spent money on and identify which things HAVE to repeat next month. Restaurant meals aren’t expenses that MUST happen. Eating at restaurants definitely falls into the Nice-To-Have territory. Going on a vacation is really nice, but you aren’t going to die without one, otherwise we would’ve died before graduating from high school. We want to first focus on the expenses which are mission critical to your family and that you can’t go without (like transportation to get to work, or childcare). Just because you love ice cream doesn’t mean it falls into this category. We are talking about rent, medicine, basic food and sustenance, etc. 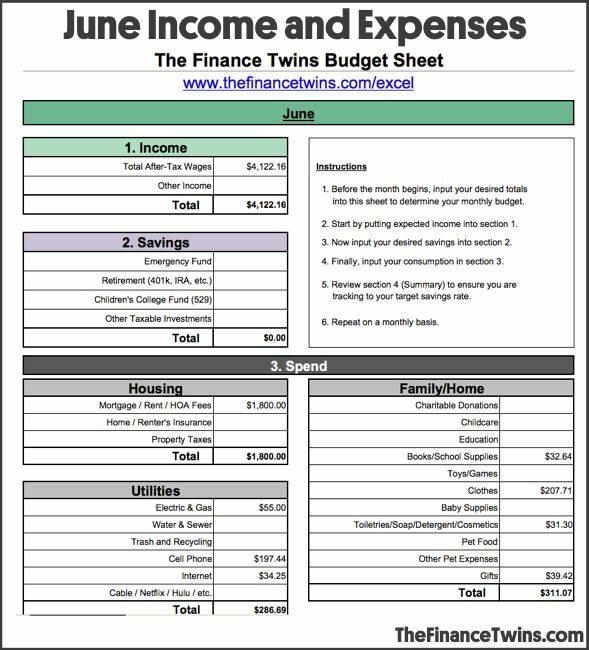 Now that we know the must-have and nice-to-have expenses we can start to fill out a blank budget template. At the bottom of the template we see how much of the take-home income we have allocated. This takes the difference between the take-home pay and all of the savings and expenses allocated. We need to allocate 100% of our income to the different expense categories to complete the budget. Every single penny we earn needs to be given a job. The goal here is to try to minimize the spend buckets and maximize the savings buckets (emergency fund, retirement savings, children’s college fund, and other taxable investments). The savings rate % at the bottom of the template is calculated by taking the Savings category total and dividing it by the Total Income. The first thing we did was input the income at the top of the sheet. If you have a fixed salary, this amount won’t change. If your pay varies by month or you expect a bonus, this will need to be adjusted monthly. Once you have input take-home pay, the next step is to decide how much you’ll be able to save. For this couple, we set an emergency fund savings target of $915.33. We worked with them to set this goal, and they felt comfortable saving this amount by cutting back on their expenses. A savings rate of 15% is great, and this is 22%, which is even better. They wanted to save more than 15% since they are getting a later start on their retirement savings. Next, we filled in the must-have critical expenses and then saw that we still had $694.25 to allocate to the other expenses. To do this we went account by account and assigned values that seemed reasonable. An example of this is $40 of discretionary spend for each of them. We find this category to be important because without the guilt-free spending account, people often get desperate for something and spend more than they meant, or they simply feel too restricted by their budget and they give up. Let’s go through the accounts so you can understand how we arrived at the final budget. Emergency Fund = $915.33 — we set a savings goal of 22.2% for them. The savings numbers should be set first, and we recommend a savings target of at least 15%. Once you know what your paycheck will be, decide how much you want to save and allocate this first. Then you’ll allocate the remaining amount amongst the other categories. If you don’t have an emergency fund, start there. Rent = $1,800 — they are locked into this lease for another 5 months. Electric & Gas = $55 — they work a lot so they aren’t home often and their bill comes out to roughly $55 every 2 months. Cell Phone = $197.44 — they need to switch to Cricket to lower their bill. Groceries = $250 — they need to begin to cook more meals at home and eat out less often. They live in an expensive city, but $250 per month is enough to cover meals for 2 people. In June, they spent $300 in groceries but that included $150 for a party. In July they only spent $72 because they were eating at restaurants so often. Restaurants = $120 — they need to stop relying on restaurants for everyday meals and lunches. They can save a TON of money by packing work lunches and preparing simple meals at home (like a chicken stir fry with veggies and rice). This is still enough for them to go to restaurants here and there, but if they want to go out more often, it’ll have to come out of their discretionary / guilt free spending category. This will allow them to go out 1x a week for a date night. Bus / Train Pass = $80 — they need to use public transportation regularly instead of relying on Lyft to get around. Planning ahead will help a lot here. Rideshare / Taxi = $50 — we wanted to cut this out completely, but left a smaller budget so that they’d have it for rainy days or times when they leave work too late to get home on the subway. Gym Membership = $45 — this is a good deal for both of them. Exercise is very important for their mental health so we wanted to leave this in the budget. Medications = $10 — our reader’s wife takes a daily medication, so this can’t be cut. The couple currently has no life insurance, but once they have an emergency fund, they need to look into ‘term life insurance’ in case something happens to one of them. Hint: ‘whole life’ insurance is rarely worth it and should be avoided by most people. Charitable Donations = $15 — our readers feel very strongly about making regular donations to their local animal shelter so we left $15 for that. Books / School Supplies = $10 — they usually buy notebooks, pens, staples, etc. for work and they said this is extremely important so we left it in. Clothes = $50 — the husband goes through clothes quickly because their job requires them to move around constantly. $50 is less than they normally spend, but they are confident they can find more affordable things at Walmart and Amazon. Toiletries/Soap/Detergent/Cosmetics = $25 — this includes toilet paper, paper towels, soap, shampoo and make-up for the couple. They think this budget is too tight but they are willing to cut back here. Gifts = $45 — One of their siblings has a birthday in August so they are budgeting for it. In September the budget will drop to $0 but then increase in October for a friend’s wedding and another birthday. Car Loan = $200.14 — they still have a few years left of this loan, but they are glad they decided to buy used instead of new. They pay for auto insurance every 6 months, so they are going to start budgeting for it next month so they have enough saved up when the bill arrives. Discretionary Unrestricted Spend = $40 each — he plans to buy new insoles for his work boots and she wants to buy a wall mount for their TV. In Step 3 we created and finalized our budget for the next month. But now comes the most important part: sticking to the budget. Some people will move to a cash only budget system and hide their credit and debit cards when they create a budget. They will then go to the bank and take out exactly the amount of money they’ll need for the month according to their budget. Once the money runs out, their spending for the month is over. This is a ‘cash envelope’ budgeting system. They’ll have separate envelopes for different expenses, and any remaining cash goes straight to savings. Other people will use a phone app like GoodBudget, which is essentially a digital version of the cash envelope. Using this system, you’ll input a transaction into the category of spend as soon as you make a purchase. This will help you keep a running tally so that you don’t go over. One of us uses this method. The other one of us loves playing in Excel and just manually tracks each transaction that way. Some people will just keep a journal that they carry with them and update it on the fly using pen and paper. As you can see, the way you track your spending doesn’t matter as much as making sure you track it. There should be no surprises. If you are budgeting with a spouse or partner, you have to make sure you both stay synced so that nothing is being forgotten or double counted. One thing that most people will notice is that once they start using a budget, their volume of transactions will begin to drop because they’ll be making more meals at home or buying things on a set schedule instead of small random impulsive trips to the store. As you’ll see once you start budgeting, it’s normal for unexpected expenses to arise. If they are emergencies, this is what your emergency fund is for. If they are just things like an unexpected friend coming into town and it means a celebratory dinner you didn’t anticipate, you have to be flexible for your budget and pull money from one bucket to another. 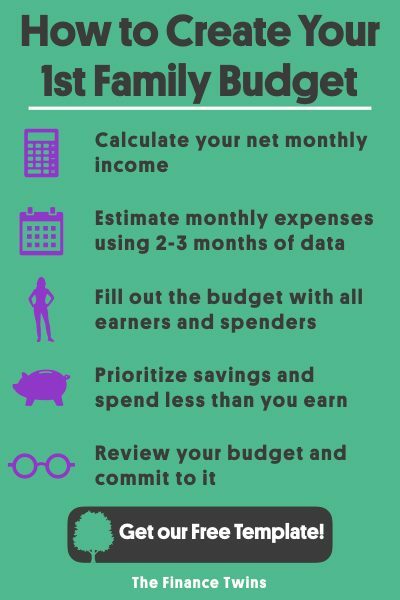 As the month is coming to a close, it’s important to adjust the budget for the next month and repeat the budgeting process. This will become 2nd nature and you’ll look forward to the process, especially when you realize the impact it is making (see your wealth grow or debt balance drop). If you have a disappointing month, stick with it and make up for it the next month! Be proactive. If you know the next month you have a trip coming up, a few birthdays, or a holiday, you’ll need to take that into account when you create the budget. You might think that once you create your first budget that your work is done and you’ll be able to use the same budget month after month. That is not the case. Sure, you can copy over the majority of the categories, but there will always be small adjustments that need to be made. It’s clear that a budget is an essential component to achieving financial independence. After all, it can help you track the most important personal finance metrics. Use a calendar. One awesome tip that we learned from a friend, who we originally taught how to budget, is to look at the coming month’s calendar when you create your monthly budget. This will help you see if you have any upcoming events like birthdays or holidays that you’ll need to plan around. Find better deals. Your budget will also be a great way to see if you are paying too much for something. Evaluate if your subscriptions / contracts make sense. Can you cut the cord and stop paying for cable? Make big decisions with your budget in mind. This couple is spending too much money on housing. When their current lease ends they need to look at moving to a less expensive home or finding roommates. Alternatively, they can increase their income. Ideally they’ll do both. They need to transition from consumers to savers, and housing will go a long way to help them. Now that they know how to budget, they’ll be able to tackle the most expensive line items. Everyone is at a different stage in their financial journey, but whether you are just starting out or are already well on your way to financial freedom, it all comes down to having a budget and sticking to it. The first few months of budgeting are tough, so don’t give up. The first budget is the worst. Just know that it gets better. It took us 3-4 months for it to become routine and second nature. After this starting period you will start to see less surprise expenses creeping into your spend. The most important thing when it comes to budgeting is being flexible. Being too rigid will make it impossible to stick to your budget. It’s like going to the gym for the first time in years and trying to run 5 miles on the treadmill. That’s just a recipe for disaster. Budgeting is similar in that you have to ease into it. One way to make the transition easier when learning how to budget, is to give yourself a monthly allowance to spend on whatever you want. This money can be spent on anything, no questions asked. Love comic books? No problem. It gives you the freedom to live your life (within reason) while keeping the big picture (future goals) in mind! We think $10 per week ($40 per month) is a good starting point for 1 person. This can increase as you begin to build wealth. 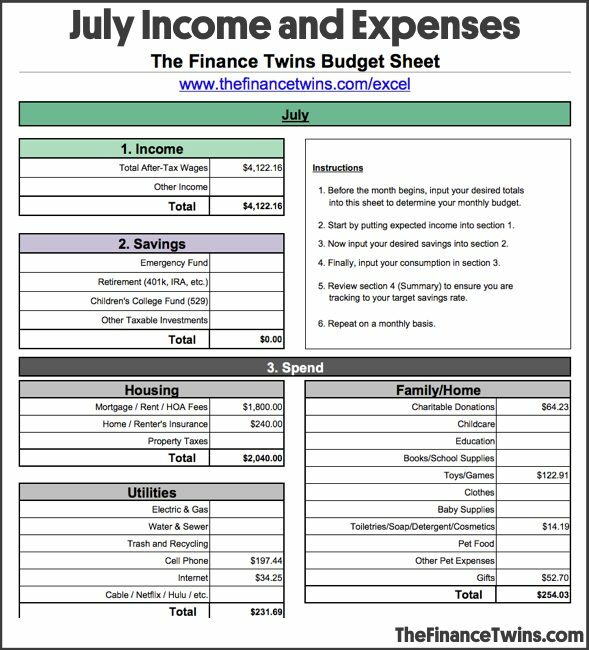 Click here to download our excel budget template spreadsheet if you are learning how to budget! We love it because it automatically adds up each category and also calculates your yearly totals for each category including savings rate! We also have a PDF version for those that like to print things out and work on them. 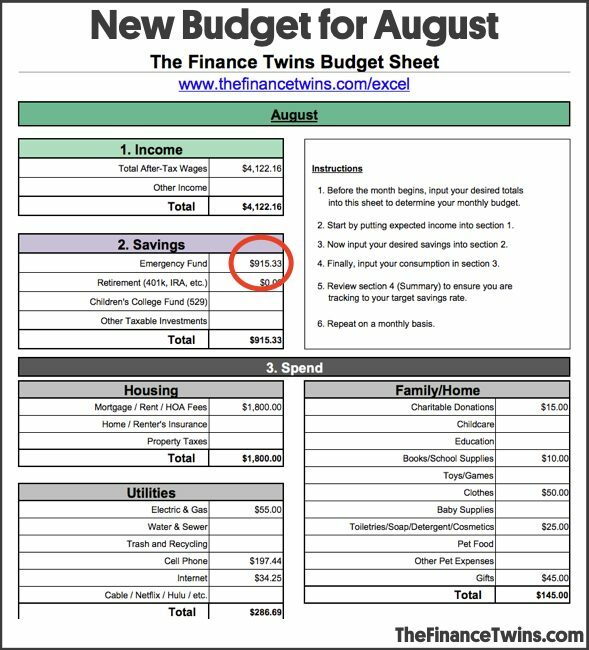 Do you recommend using the excel or pdf template for my first budget? Hey Charles, we personally think the excel is better for record keeping, but it comes down to what you feel most comfortable with. If you don’t have any excel experience and find it intimidating, the pdf is a great place to start. If you are an excel guru you’ll feel right at home with the xlsx version! What should I do if my budget for April didn’t include a couple of items I forgot about? Hi Mary, what you describe is totally normal for the first few months of budgeting. The important part is that you created a budget. When we realize we have an unexpected event, we will try to pick a few other places in our budget where we can cut back in order to not go over the budget for the month. If you feel like you absolutely cannot cut any further, that is okay. Just take it into account next month and make up for it over the next few months. At the end of the day, missing the budget in 1 month is okay if you stay on track for the year. Hello! I downloaded your budget template, but it was saved as a “read-only” file. Any idea on how I can fix this issue? I would love to use it! Thanks. Thanks its amazing to read. I’m a old fashion guy who still believe into envelope mechanism but this is the first time I learn that the excess money should need to move into savings (as I always use to treat myself with this money ). Could you pls. Guide me more which savings I need to move this amount into long term planning savings /emergency fund/ any others …..
Much thanks for sharing your expertise. Hey Danesh, thanks for reading. If you have an emergency fund, then you can begin to think about saving for retirement and other financial goals. The important thing is to keep your savings rate up, as that will drive your ability to save and invest!